Phoxel Unit Converter 1.0 free download. Phoxel Unit Converter is an easy-to-use freeware that will let you convert from-to any unit. Phoxel Unit Converter is an easy-to-use freeware that will let you convert from-to any unit. Phoxel Unit Converter is an easy-to-use freeware that will let you convert from-to any unit. You can access 16 different topics that includes (Volume, Weight, Pressure, Temperature, etc). Phoxel Unit Converter also allows you to choose the number of decimal places and gives you the option to display the results in scientific notation. Unit Converter is a simple, easy to use unit converter with all the basic units. 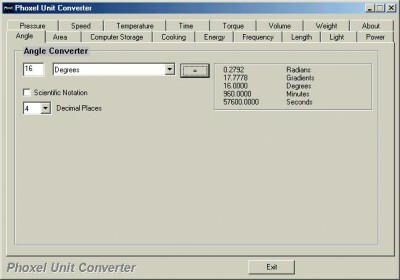 Pico-Converter is a powerful unit converter tool, that can convert more than 1,600 various units of measure in 26 categories. HM Basic Unit Converter is an easy to use and powerful unit converter. Easy Unit Converter converts most frequently used length, area, volume, temperature and weight measurement units with a single button click. PicoConverter is a powerful unit converter tool, that will help you convert more than 1,600 various units of measure in 26 categories. A Simple Unit Converter - A Program to convert Units, Converts Many Imperial Units to Metric and back again. Unit Converter is a freeware utility that can take care of all your unit conversions even when offline. POKLUDA Conversion is a very helpful unit converter with more than 3,500 conversions between metric units and SI units. Converts from one unit of measure to another. Calc98 is a pocket calculator simulator program for the Microsoft Windows operating system. Universal Converter is a useful conversion utility that converts UK and US values to their Metric counterparts and conversely. Quick Conversion is a handy application that will easily convert several units of weight, length and capacity measures. Syscalculator Euro Edition Eurocalculator can convert your money values from one of 12 former currency units to the new Euro value.